What does a VoIP Monitoring Software do? A VoIP analytics & monitoring software helps in monitoring voice calls in a VoIP system for call usage tracking and performance analysis. An efficient VoIP monitoring tool can help you visualize and pinpoint call issues over the entire network. Monitor your VoIP performance along with bandwidth and traffic consumption specifics. Troubleshoot packet loss, latency and jitter, among other factors in a VoIP system. Worried about poor VoIP call quality? Wanting to add more VoIP lines but clueless on how your network would handle the extra traffic? The new VoIP management addition to OpManager provides a clean, centralized monitoring center for your VoIP network. Being able to always view the top call statistics allows you to quickly identify any possible issues. Another key feature is the report section where historical data can be used to view trends in performance. Senior Network Engineer, NASA’s Advanced Supercomputing Division. VoIP monitor seamlessly integrates with OpManager to proactively monitor and report on WAN infrastructure’s capacity to handle VoIP calls. 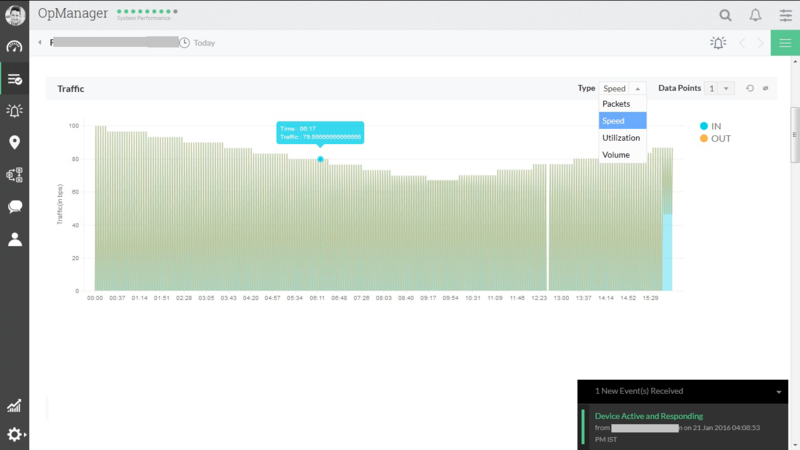 Using Cisco IP Service Level Agreements (SLAs), OpManager continuously measures critical Quality of Service (QoS) parameters of VoIP services to provide insights on VoIP network performance. VoIP quality metrics measured include packet loss, delay, jitter, the Mean Opinion Score (MOS) and Round Trip Time (RTT). Since the cloud is the communication medium, a VoIP calling endpoint never gets a dedicated end–to–end line unlike traditional circuit–switched networks. This can bring nightmares to network personnel who maintain VoIP call quality. They need continuous network health status of not just their own corporate WAN, but also that outside WAN precinct, through to ISP networks. By virtue of the Cisco IPSLA technology present in a wide number of network devices, VoIP Monitor provides in–depth QoS visibility over call paths within WAN and also for calls between corporate users and other users in ISP networks. Does huge packet loss happen during high bandwidth usage hours? Which user or which type of traffic consumed most bandwidth? 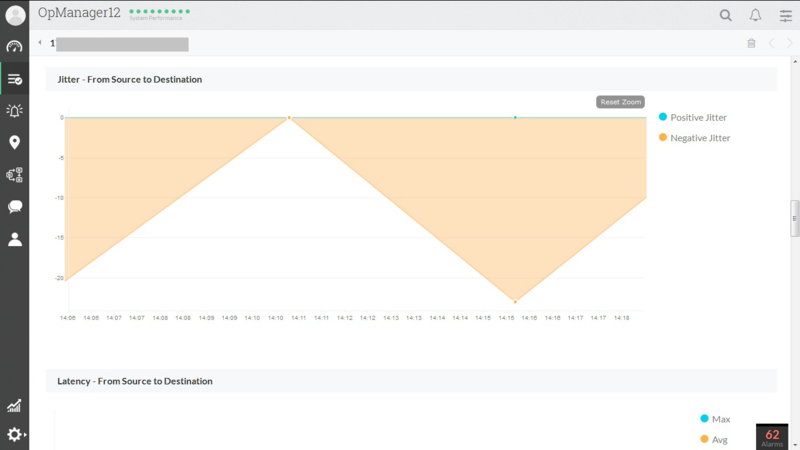 OpManager’s VoIP Monitor tool has in-depth NetFlow traffic reports placed alongside VoIP QoS trend graphs to help in quickly troubleshooting VoIP performance problems. The originator of a call could be within the corporate WAN and the called party could be located outside in the ISP network, or vice versa. VoIP monitoring tool provides Source-to-Destination and Destination-to-Source statistics on Packet Loss, Delay and Jitter values. You can now easily find out which side of the call faced poor VoIP quality and why. Reports for call traffic that happened days⁄months ago together with interface error & utilization reports help in trending, analysis & capacity planning of network resources. 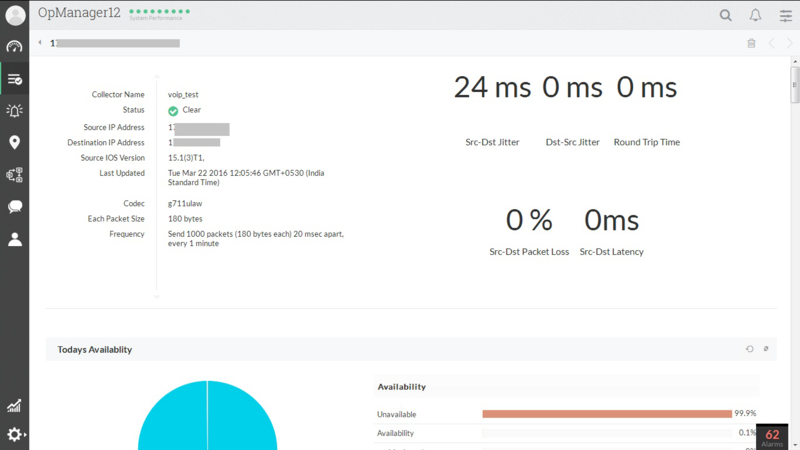 An immediate dashboard view of Top 10 call path reports by MOS, Packet Loss, Jitter, Latency, Maximum SLA violation and Maximum RTT ensures that you are in the know of likely problem areas. OpManager’s VoIP Monitoring tool automatically enables Cisco IP SLA in selected source routers. A VoIP template allows you to easily simulate different traffic loads so as to analyze VoIP service performance over varying VoIP traffic loads. All the threshold limit settings for alerts and alarms are also customizable for effective VoIP performance management.